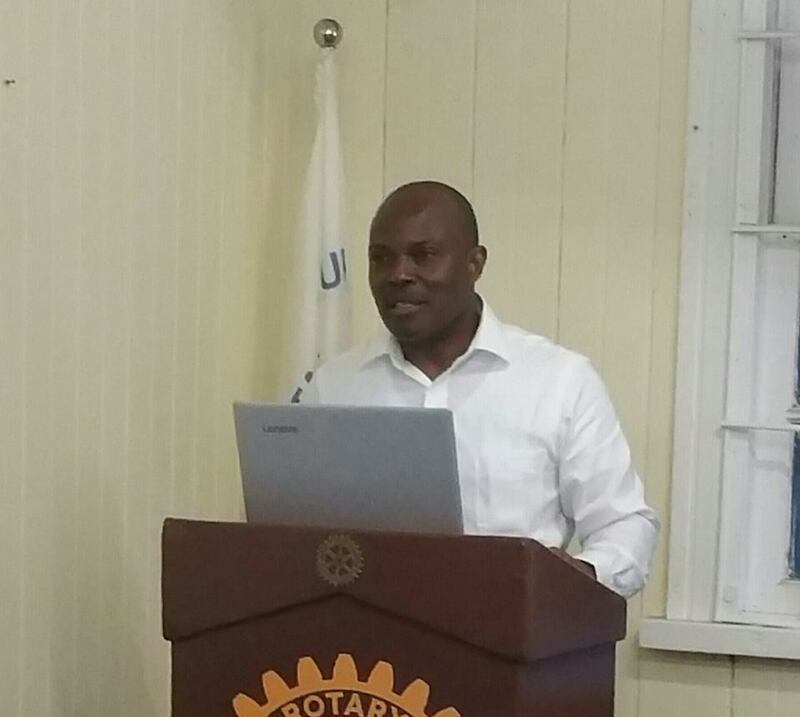 1 2-Aug-17 Speech delivered to Rotary Club, 2nd August 2017 – Telecommunications Regulatory Reform. Good Afternoon Ladies and Gentlemen. First let me say thanks for your kind invitation. It is a great privilege and honor to address you this afternoon on this important topic: Telecommunications Regulatory Reform in Antigua & Barbuda. Unless you have been living on another planet or under a huge rock for the past 15 years or so, I am sure you will agree with me that our word is changing in real and profound ways. Changing in ways that are permanent; changing in ways that are empowering; changing in ways that can at times seem scary; and changing in ways that affect all of us. This change that I speak about is the change being brought about by information and Communications Technology (ICT). As a generation, I believe we are blessed to be living at an inflection point in human history. Today, Information and Communications Technology is transforming the way we interact with each other and our physical environment, the way we learn, and how we share our ideas. In fact, there is no area of human endeavor that is not touched in some way by Information and Communications Technology. What is even more remarkable, is the short space of time that these changes are taking place. I remember, like yesterday, when we first launched Internet service in Antigua & Barbuda and experienced the world wide web for the first time. I remember my first cell phone - the size of a small laptop with a handle, shoulder strap and a detachable handset because it was too large to place to your ear. It all seems like just the other day! Importantly, many of the challenges faced by Caribbean countries like Antigua & Barbuda – relatively small size (market), remoteness, high energy costs, rising levels of crime, inadequate access to quality health care, can be addressed with smart application of existing technologies. Moreover, the emergence of new concepts such as the Internet of Things, Big Data and Artificial Intelligence, seems set to change our world even further, in ways and in directions that are hard to imagine. As Caribbean people however, as difficult as it might seem, it is important that we begin to re-imagine the possibilities. But imagination is not enough. We must act. 2 2-Aug-17 Unfortunately, the reality for us is: notwithstanding all the progress we have witnessed, over the past several years, Antigua & Barbuda has fallen behind in the level of access to and the application of ICT’s when compared with several Caribbean countries - including several in the OECS. The evidence is quite clear: over the past four years A&Bs ranking in the ITU ICT Development Index (IDI), has declined almost 15 places. In the OECS, we now rank behind St. Kitts, Dominica, and Grenada. And, as far as the quality of broadband service is concerned, I am sure you are as shocked as I am with the positive difference encountered whenever you travel outside of Antigua & Barbuda. No doubt, you feel it in our pocket, as well, every time you pay your bills. And with broadband being the important enabler that it is, it should be concern to all of us that Antigua & Barbuda ranks close to, if not, the bottom of the class when it comes to speed, quality of service and affordability. There are many reasons for this anomaly, of course, and they are not at all economic. I suggest that the missing ingredient: badly needed and has been talked about for far too long is the urgent need for Regulatory Reform. What do I mean by Regulatory reform? Most of you, I am sure, would be surprised to learn that in Antigua & Barbuda today, the principal law which governs Information and Communication dates to 1951. You heard right 1951! Looking around, I suspect some of you have parents who are not even as old as this law. This law has been in existence: before many homes even had electricity let alone a phone; before mobile technology was invented; before the Internet; and long before broadband. Even worse, since then, every piece of secondary legislation enacted has been about protection: Protecting APUA; Protecting the Government’s revenues; protecting Cable & Wireless; protecting the status quo. It is truly sad that I must say this but, none of the efforts since 1951 have, in my humble opinion, been about protecting the public interest. 5. To create an open market for telecommunications services, including conditions for encouraging and enabling fair completion, through effective regulation. One important outcome of the new law will the creation of a Telecommunications Regulator which is independent of the operators, with the powers, tools and expertise needed to carry out its mandate. It will be self-funded through fees collected from Licensees, governed by a Board of Directors and staffed by a team of professionals. In short, for the first time, telecommunications in Antigua & Barbuda will be governed by the rule of law rather than any single corporate entity or single Minister. So, along with physical infrastructure, and the upskilling of our people, new digital infrastructure will be critical to delivering the next wave of innovation and economic growth that is so badly needed in our country and in the region. And, importantly, the right policy and regulatory environment will be what helps to build that digital infrastructure. 1. The Bill is expected to go to parliament, for the third time, later this year. It is our sincere hope that by December 31st, 2017, it will become the law of the land. 2. Learn as much as you can about the subject. 3. If you are in business, education or whatever your professional endeavour, you need to begin to apply digital thinking in almost everything that your do.